Telangana Vidya Volunteers (VVs) Merit List / Selection List 2018-18 Allotment order. 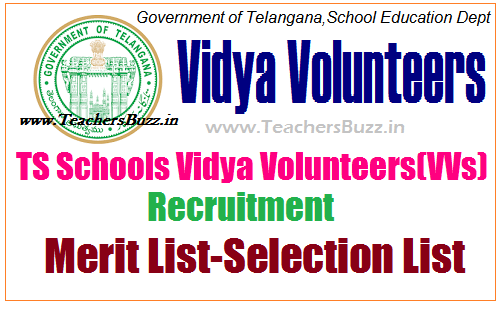 TS Vidya Volunteers (VVs) Recruitment 2018 Notification Online Application form, how to apply,vacancy list, district wise vacancies,Merit List / Selection List 2018-19 :TelanganaVidya Volunteers Merit List / Selection List 2018-18 ,TS Vidya Volunteers (VVs) District wise Merit List /Selection List 2018-18-Telangana VV's Appointment Orders 2018, TS Schools Vidya Volunteers Merit List /Selection List , Telanagana VVs selection list, Telangana Vidya Volunteers Merit List/ Selection List Dist Wise appointments 2018-18, TS Vidya Volunteers (VVs) merit list 2018, Recruitment of ts Vidya volunteers merit list , selection list , telangana vvs selection , ts vidya volunteers merit list,Vidya Volunteers appointment list telangana vidya volunteers General Merit list, TS Schools 11428 Vidya Volunteers(VVs) selections 2018, Notification-New Guidelines,Selection Procedure. TS Schools Vidya Volunteers Merit List District Wise Selection List released for the academic year 2018-18 to fill up 11428 Posts in Telangana State. Telangana State government has decided to appoint Vidya volunteers on a temporary basis for one year. The vacancies as per new strength as on 30.06.2018 and as per new rationalization guidelines. Interested Candidates to work as Vidya Volunteers may have to Applied Online for Vidya Volunteers/ VVs/ Academic Instructors Recruitment in Telangana from 01.06.2018 onwards. TS Vidya Volunteers Online Application Closed on 16-07-2018 in 31 Districts of Telangana state. Apply Online From 13-07-2018 to 16-07-2018 , Submission Of Printout Copy Along With Certificates To MEOs Upto 16-07-2018, MEOs TO DEOs Upto 17-07-2018, Selection At DEOs Upto 18-07-2018, Verification & Issue Of List To SMCs By MEOs On 19-07-2018, Engagement Of VVs At Schools From 20-07-2018.